The Cutty Sark in Greenwich is a London landmark and an icon of British maritime history. It’s also one of the most famous ships in the world and a top London tourist attraction. 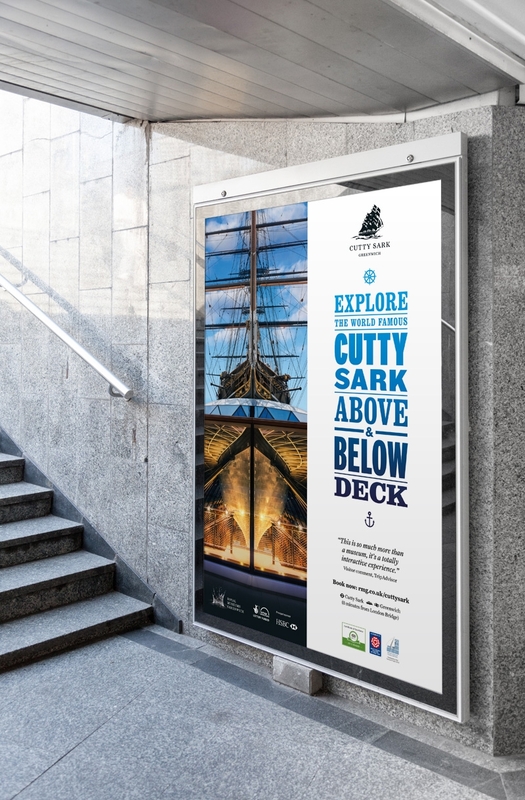 Since its relaunch in 2012 advertising campaigns have focused on the spectacular view looking up at the hull from underneath the ship. Our tourist campaign was aimed at promoting a different perspective, and a more rounded interactive experience. Our concept was based on exploration and discovery ‘Above & Below’ deck, using typography inspired by 19th Century naval recruitment posters. Representing the whole ship was a challenge, but necessary to show that the Cutty Sark provides a unique museum experience as you literally walk through, above and below history.